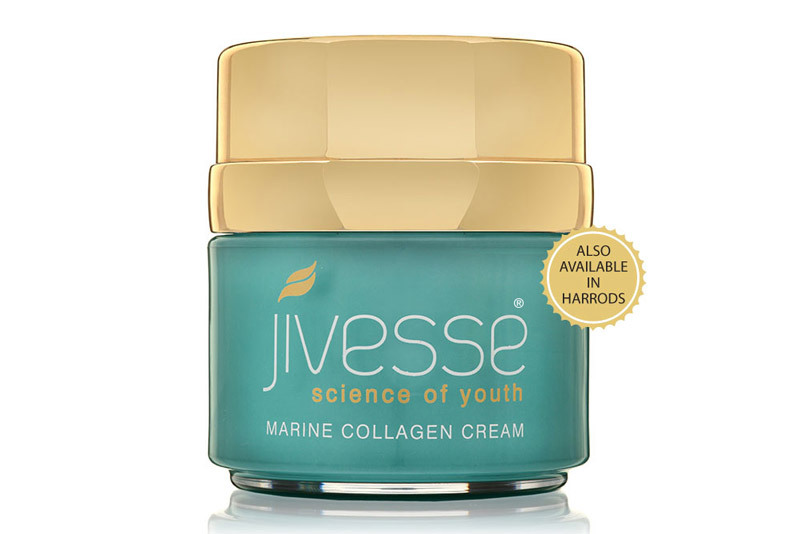 The Jivesse Marine Collagen Cream is a multi-dimensional anti-ageing cream containing potent active ingredients to rejuvenate and accelerate the natural production of collagen in your skin and defend against the key signs of ageing. Whilst the key active ingredients are absorbed deep into the skin, a layer of moisture on the surface is provided, which ensures skin remains supple hours after application. The Kakadu plum extract found in the cream; contains the highest level of Vitamin C found in any plant in the world. Vitamin C aids cell growth and contributes to the strength and firmness of the skin. The cream is enriched with the highly absorbable bioactive peptide Peptan to help reduce the appearance of wrinkles, improve elasticity and counteract the loss of firmness over time. This multi-dimensional anti-ageing and hydrating cream contains potent active ingredients with unique properties which look to rejuvenate and accelerate the natural production of collagen within your skin. Incidences of deep wrinkle formation are reduced, skin appears firmer, with improved elasticity and moisture, providing more luminosity in skin tone and a youthful looking glow whilst preventing the key signs of ageing. 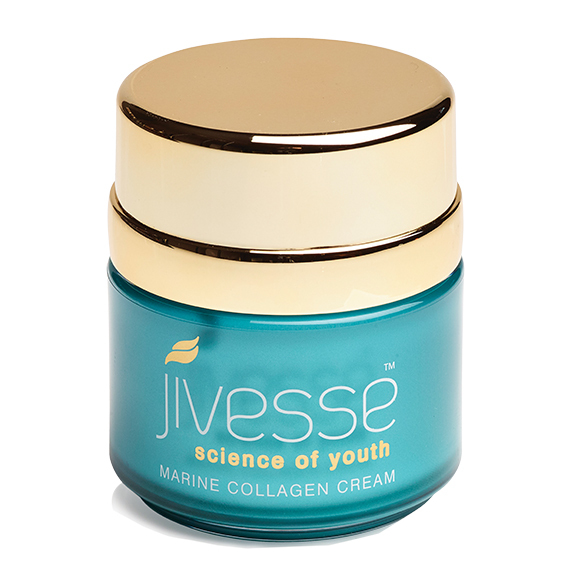 Whilst the key active ingredients in the Jivesse Marine Collagen Cream are absorbed deep into the skin, the cream continues working on the surface, providing a layer of moisture ensuring the skin remains supple hours after application. Epidermal Action – The slow release of moisture provides up to 12 hours of hydration, ensuring the skin remains supple and moisturised throughout the day and night. 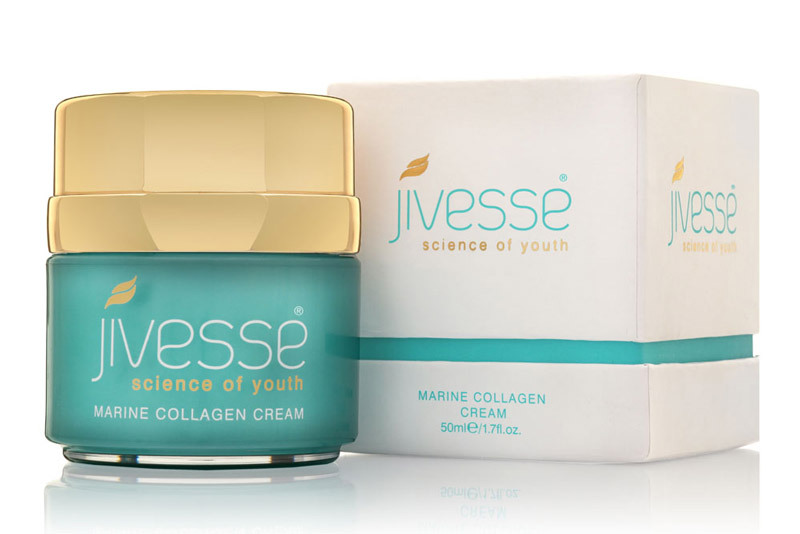 Dermal Action – The ingredients in the Jivesse Marine Collagen Cream are absorbed deep into the skin boosting collagen production and fibroblast proliferation minimising wrinkle formation and improving skin texture. The Airless Jar – Protects the cream from exposure to light and air preventing contamination, optimising the efficacy of the product and guaranteeing the longevity of the active ingredients. One pump provides up to 1ml of cream. 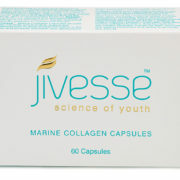 The cream is enriched with Peptan®, the purest of marine collagen peptides, which protect the extracellular matrix of the dermis, counteracting the loss of firmness and moisture occurring over time which would typically lead to wrinkles. Argireline® reduces deep wrinkles caused when your muscles contract due to facial expressions. Predominantly this happens in the forehead and around the eyes. A safer cheaper alternative to Botox, Argireline® targets the wrinkle formation in a different way. Liftonin® Xpress is an innovative, instant tightening and lifting active ingredient that is based upon a revolutionary transfer of technology. Various types of wrinkles are visibly and measurable minimised by creating a physical tightening and smoothing effect on the skin. 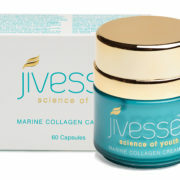 The Jivesse Marine Collagen Cream contains the highly effective humectant, Glycerine. Humectants are known as being hygroscopic which means they attract and retain moisture from the atmosphere via absorption, drawing the water vapour into and beneath the skins surface. 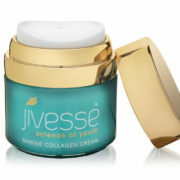 The glycerine in the Jivesse Marine Collagen Cream draws up moisture through the skin layers and prevents excessive drying. This keeps the skin elastic and thus plumps up and tightens the epidermis. Glycerine maintains the skin’s water balance leaving it feeling softer, suppler and overall healthier. Fucogel® is an active ingredient which has a double action approach to skin health and ageing. It has a physical effect on the skin provided by its hydrating properties and a biological effect which is experienced through the stimulation of proteins in the epidermal layer of the skin resulting in a soothing of the skin and anti-ageing benefits. 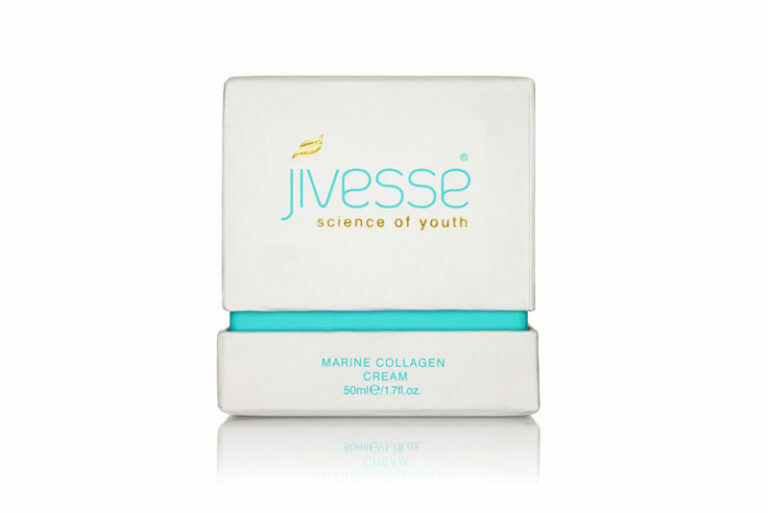 The hydrating properties of Fucogel® are comparable to that of Hyaluronic acid supporting the ability of the Jivesse Marine Collagen Cream to plump up the skin and visibly improve skin texture and appearance. Anti-oxidants are molecules that can interact with free radicals to stop a chain reaction which can lead to damage of vital molecules in the skin. In order to understand the role of antioxidants we first need to look at free radicals. Once a free radical is formed a destructive chain reaction could start. Free radicals cause dryness and increases fine lines and wrinkles on the epidermis. The damage to cellular components is dangerous, and in order to prevent this from occurring, the body uses antioxidants. One of the main antioxidants found in Jivesse that will counteract the damage on the body is Vitamin C. The human body cannot produce Vitamin C, and so it must be introduced via external means. 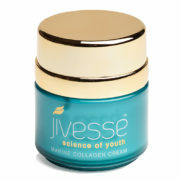 The Kakadu Plum, in the Jivesse Marine Collagen Cream, contains the largest amount of Vitamin C found in any plant. As well as protecting the skin against free radicals, Vitamin C aids the growth of cells and blood vessels and contributes to the strength and firmness of the skin. The Retinyl Palmitate molecules that penetrate the outer layers of skin look to repair layers of skin where collagen and elastin reside. Retinyl Palmitate is a form of Vitamin A which is considered to have similar properties as Retinol. 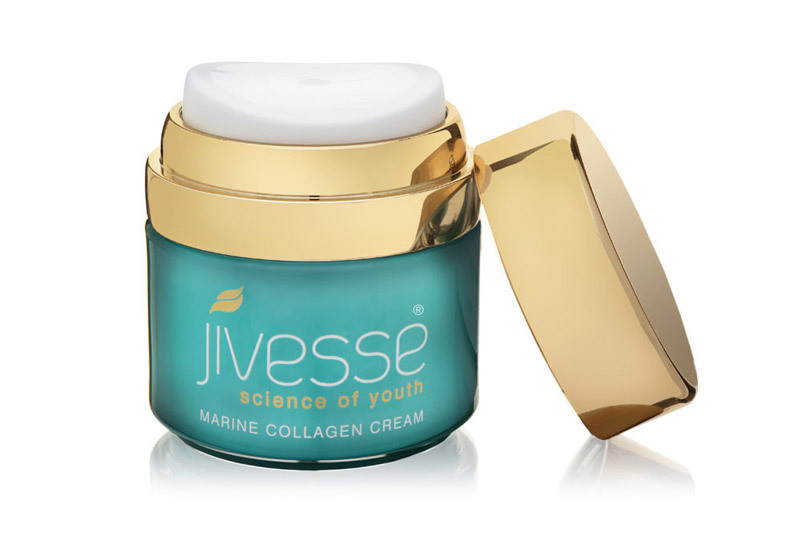 A natural protection from harmful UVA sunlight, which in the Jivesse Marine Collagen Cream acts as an in-built SPF system; the raspberry seed oil keeps skin looking youthful all year round. Key anti-oxidants that aids skin rejuvenation the avocado oil promotes cell renewal and regeneration. Twice daily apply 1 pump of the cream to fingertips and use a circular motion to rub the Cream into the face, neck and décolletage. 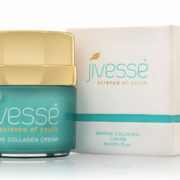 The Type 1 collagen peptides, Peptan, used in the Jivesse cream are the purest form of peptides which, when topically applied, protect the extracellular matrix of the dermis. The airless system used in the design of the jar optimises the efficacy of the product and ensures the formulation continues to guarantee longevity of the ingredients. It’s very comfortable and gental . I touch my face I can feel really smoothly.